The Stamford Free Church was founded in 1959. It is a member of the Baptist Union (East Midlands Baptist Associations) and Evangelical Alliance. The elders are John Chambers and Rev. May Lloyd. 10:30am - A mixture of visiting speakers and church members lead the service every Sunday, so that we can enjoy a variety of working patterns. Communion is taken on the 2nd and 4th Sunday of every month. We serve refreshments after each service. 3rd Sunday at 6:30pm - Every 3rd Sunday of the month, we have a Draw Near - Meditative service incorporating Iona and Taize worship. 5th Sunday at 6:30pm - Every 5th Sunday of the month we have a Healing Service. In this service there is prayer, laying-on of hands and communion. The church has various different activities in which you could be involved. The church holds housegroup meetings at different venues each week at different times. On Monday mornings, 9-11:30am, a Coffee Morning is held. On Monday evenings Table Tennis is played. The church has two teams in a local league. On the last Thursday of every month there is a lunch club from 11am-2pm using our excellent kitchen facilities. We also have occasional coach trips, outings and shared lunches. We do not have any children's activities now, simply because we do not have any children. We would be very keen to support anyone wishing to begin a work of this kind either for children of any age or for teenagers. 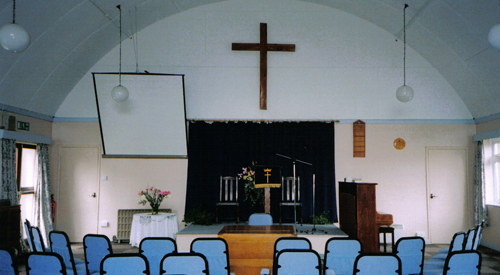 The church premises are available for the use of other churches and some non-church groups. At present these include a slimming group, a choir, WEA classes and blood donors. Besides the main church room there are a number of smaller rooms. We are licensed for weddings, although a registrar is required, and funerals. There is no set charge for these, however, donations to cover expenses are welcome. The church offers easy access for the disabled and has a disabled toilet. We also have baby-changing facilities. The church also has a large car park adjacent to the church buildings. To book the premises, or for any further information, please feel free to ring.